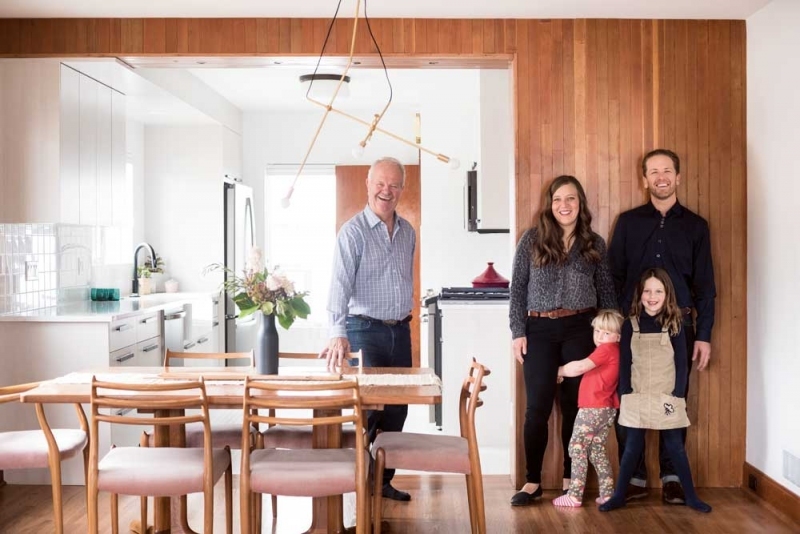 Restoring an inner-city 1930s home was a labour of love that brought together a family whose own history is steeped in the neighbourhood. Architect, Ryan Schmidt, Ryan Schmidt Architecture Studio, rsarchitecture.ca; Builder, Ironwood Building Corp, ironwood.ca; Photograph by Jared Sych. 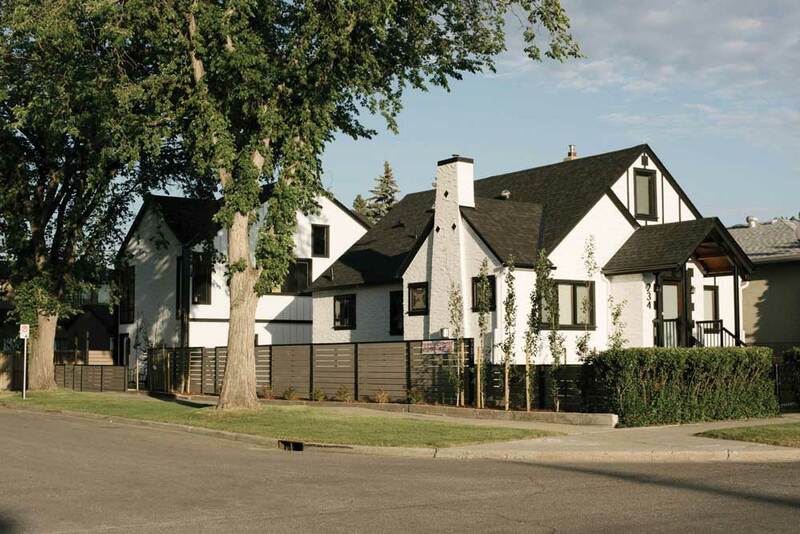 Architect Ryan Schmidt knew he had stepped into an exceptional house in Bridgeland even before he found out a Stanley Cup champion had lived in it. “My dad knew [the house] right away,” says Schmidt, who is in the fourth generation of his family to call Bridgeland home. David “Sweeney” Schriner was one of hundreds of German-Russian immigrants who grew up in the inner-city neighbourhood, just like Schmidt’s own great grandfather. Schriner was a left-winger for the Toronto Maple Leafs and Hockey Hall of Famer and owned the one-and-a-half storey property back in the 1930s. The home changed hands only once before Schmidt took ownership. 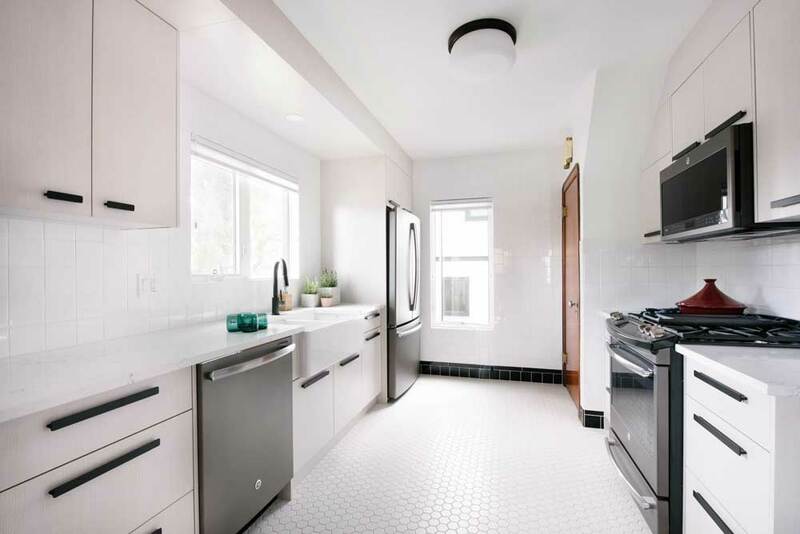 Schmidt credits the second owners of the home for leaving the original art deco window casings, brass door hinges, crystal doorknobs, light fixtures and hardwood floor in mint condition. “There’s no gapping in the original one-inch oak hardwood – it’s remarkable,” says Schmidt of the floor, which was preserved in part by decades of being covered with carpet. That cleanup involved a year of gutting, updating and expanding the 900-square-foot space to 1,700-square-feet by converting the attic into the main bedroom suite. 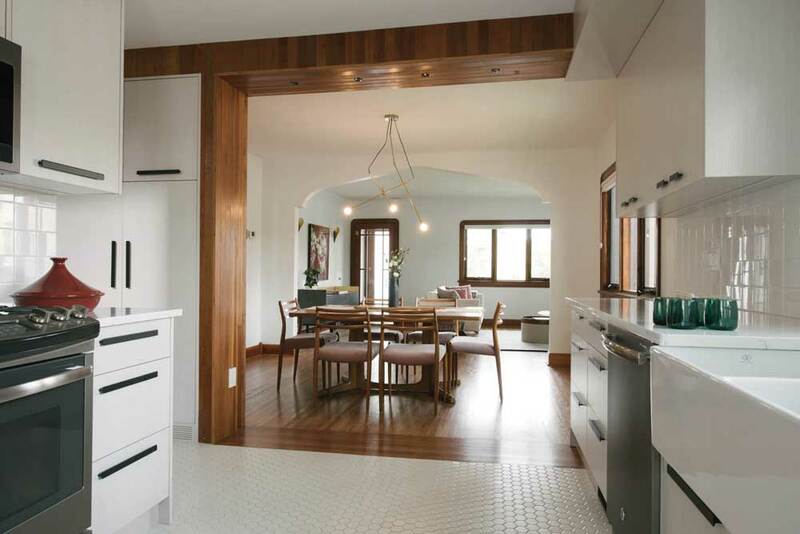 But even though Schmidt has lots of experience with renovations, this one, like many, came with some pricey surprises. To start, a remediation crew removed asbestos from the house. Schmidt also had the electrical updated to replace the original hazardous knob-and-tube wiring. And he replaced the old gravity furnace with new ducts and a high-efficiency furnace. After Schmidt discovered there was no insulation behind the old plaster, he decided to rip out all the exterior walls. But because he wanted to preserve all of the original fir wood trim around doors, windows and floors, everything had to be very carefully dismantled and then equally fastidiously refinished and reinstalled. Schmidt says he couldn’t have done this project without his wife Meghan Drennan’s artistic eye and his father Lyle Schmidt’s sweat equity. “[My dad] took on an epic amount of work,” says Schmidt who practically grew up on construction sites thanks to his father. That passion is evident in the care the Schmidts put into restoring historic details and the thoughtful inclusion of modern amenities and services throughout the home. An original brass thermostat is juxtaposed next to a 21st century digital model. 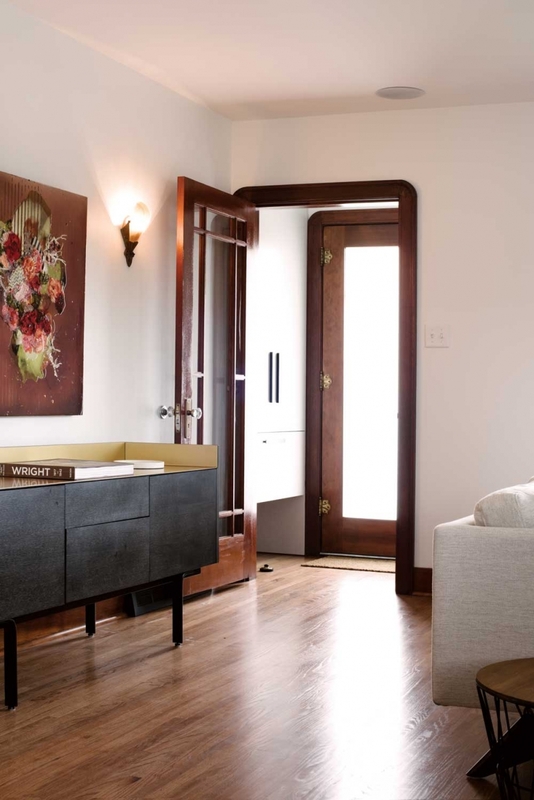 Original scalloped brass door hinges, skeleton keys and heat vents live among the modern conveniences of a Vacuflo system and speakers built-in flush to the ceiling. Reclaimed fir planks from the attic clad a new wall between the kitchen and dining area that incorporates a pantry. The Schmidts replaced the home’s ornate wallpaper and busy drapery with white walls and sleek blinds, exposing the rich caramel fir trim around windows and doors. The beauty of the art deco wall sconces and pendants also came into sharp focus after being cleaned and retrofitted with new wires and LED bulbs. 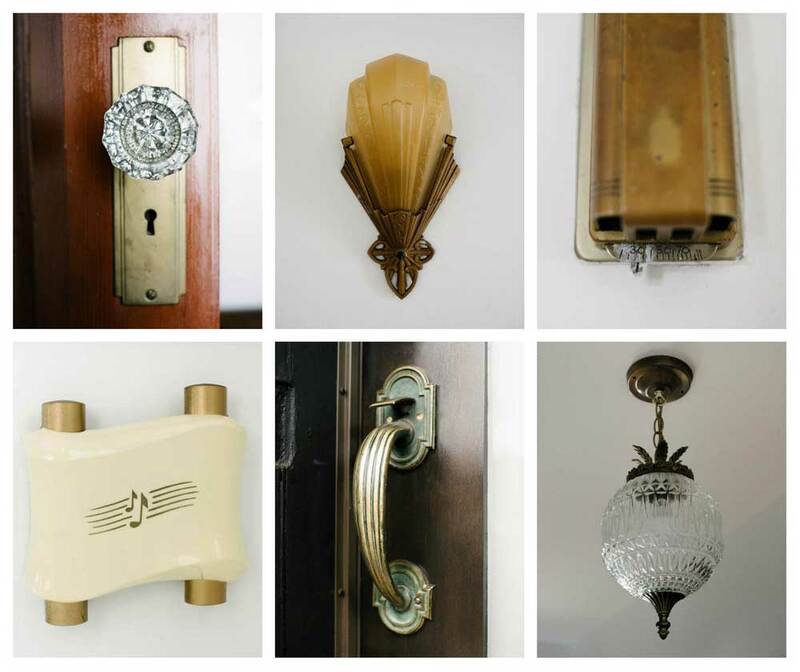 The home is full of beautiful details ranging from door handles to an original brass thermostat. Photograph by Jared Sych. 4. Find experienced trades. “The right carpenter for a house like this was critical. Do your homework and find someone who is patient. Our finishing carpenter was a miracle worker,” says Schmidt. The original fir trim around the windows and doors was one of many details the homeowners chose to preserve. Although the kitchen is brand new, its whitewashed rift-cut oak cabinets and farmhouse sink are consistent with the home’s heritage aesthetic. You can see into the dining and living rooms from the kitchen. 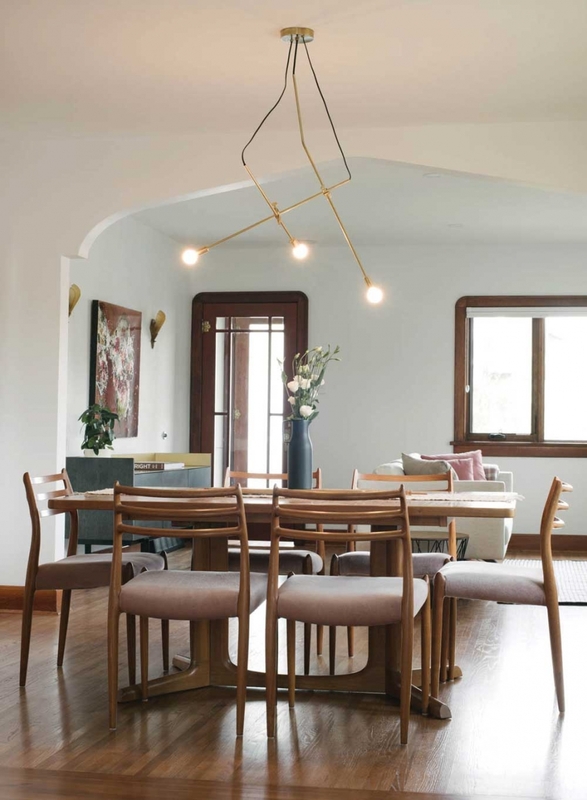 The dining room has a Niels Otto Mller table and chairs and a light fixture by Lambert & Fils of Montreal. 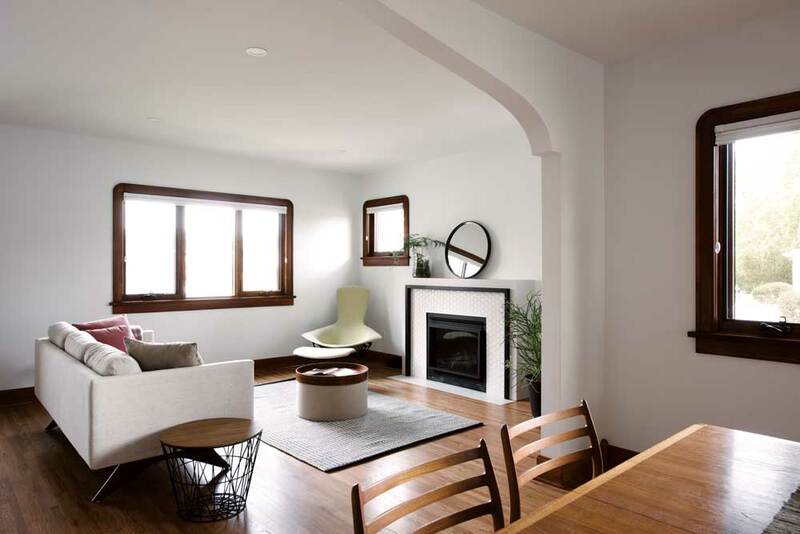 The formerly non-functional attic space was gutted and transformed into an 800-square-foot bedroom suite with a view of downtown Calgary, complete with walk-in-closet, ensuite and washer and dryer. To expose the beams of first-cut fir the drywall had to be cut, mudded, taped and sanded around each beam – a job that architect and builder Ryan Schmidt described as “rigourous,” though the result is “the one detail that captivates everyone.” Schmidt also scoured the continent to source fir flooring that would match what was original to the home. He found it at a family-owned mill near Kalispell, Montana, that specializes in niche wood products. 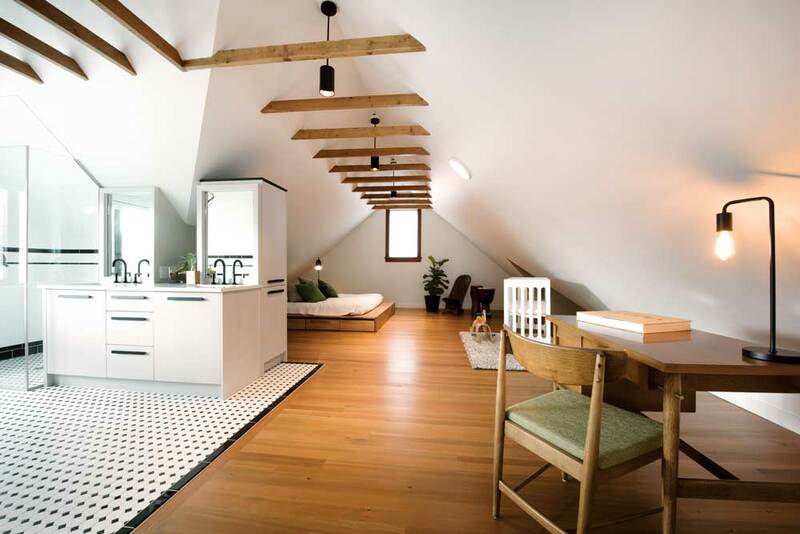 The exposed beams continue into the bathroom. 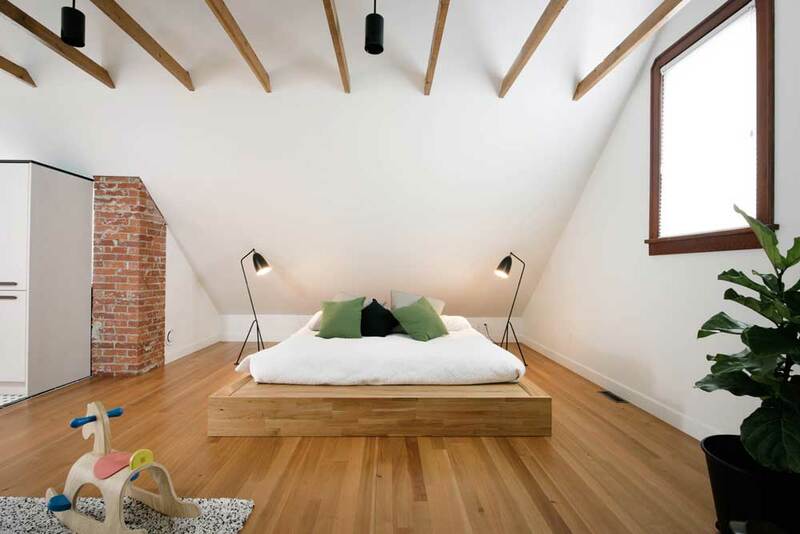 Attic-suite bed by Mash Studios LAX series from Kit Interior Objects. Photograph by Jared Sych. Another view of the attic bedroom suite. A look inside the attic bedroom suite’s bathroom, which also has a walk-in-closet. The exterior of the home also received renovations with work done on the stucco and exterior window and door trims.